A very solid choice for anyone after a highly adjustable, classic-sounding reverb plugin, the only downside being its price tag. Essential controls readily to hand. Gate functions are handy. Delivers the Lexicon sounds. Keyword-based presets. R2 is one of two debut plugins from new company Exponential Audio (the other being Phoenix Verb). Company founder Michael Carnes is the DSP wiz behind the Lexicon PCM Native Bundle and various other high-end Lexicon reverbs. So, although it seems to have appeared out of nowhere, this plugin has to be taken very seriously indeed. Upon first firing up R2, the archaic-looking GUI comes as a bit of a shock. Compared to similarly priced plugins - which usually sport beautiful, visually striking interfaces - this one's a tad clunky to say the least. Having seen Exponential Audio's 90s-style website, perhaps we shouldn't have been surprised. This admittedly minor niggle aside, R2 is sensibly laid out and easy to get your head around; and of course, as long as the pricetag is justified by the sound, that's very much the main consideration. "R2 is very much cast in the Lexicon mould, conjuring up rich, dark reverbs"
The left-hand side of the interface hosts a frequency amplitude display with an overlaid output filter curve visualising your current filter settings. Below this are the main level controls for the early reflections and reverb tail, and an output filter cutoff frequency control. There's also an extra filter cutoff frequency control - which lets you apply filter curves to both early reflections and the reverb tail - and dedicated Gate and Chorus functions. 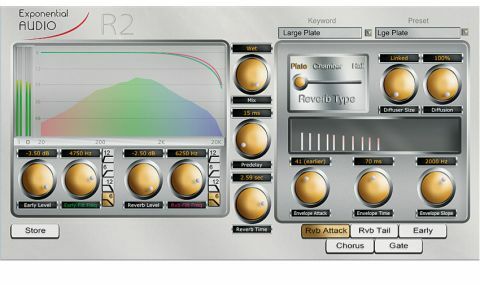 R2 lets you add a low- or high-pass filter to the reverb output, with a choice of 6dB or 12dB/ octave slope for each - it's a shame you can't apply both types of filter at once, doing away with the need to fire up a separate EQ. In the centre of the GUI is the main reverb Mix control along with the essential PreDelay and Reverb Time knobs. So, with the left and centre sections, the most essential controls are readily to hand. Should you wish to delve a bit deeper, the panel to the right is where full-on tweaking begins, its three tabs hosting a wide range of further parameters. Particularly noteworthy is the Rvb Attack section's Reverb Type slider, which enables quick changes between Plate, Chamber and Hall reverb types without a full change of preset. Also, the Rvb Tail section features a Width control that can be used to narrow the stereo field or blow it up to super-wide proportions. Dropping R2 into a mix it becomes apparent that R2 is very much cast in the Lexicon mould, conjuring up rich, dark reverbs. Given this genesis, it's no surprise that many of the presets deliver predictably Lexicon-esque sounds - large Halls and Chambers abound, but at a lower price-point and without the multiple plugin loading hassles of the Lexicon PCM Native bundle. "R2's colourful nature and functions make it ideal for sound design applications"
R2 uses a keyword-based preset system: you begin by choosing a keyword such as 'large', 'small plate' or 'drums', which loads up all of the presets relating to that word. Should you prefer, though, you can dispense with the keywords and simply view all the available presets in one long list. Assigning keywords to your own presets is a doddle, too. The Compare button lets you A/B compare whatever edits you've made to the original settings of the current preset, while the useful Reload function recalls the original preset, should you find that you've wandered off in the wrong direction with your changes. R2 is a well-thought-out reverb. Along with solid presets, all crucial controls are within easy reach, and detailed fine-tuning is available should you wish to get more involved. Its colourful nature and functions make it ideal for sound design applications, and it's the best Lexicon-style reverb we've come across yet, easily in the same league as Lexicon's own products (as you'd expect). Ultimately, this is an excellent reverb, powered by its own distinctive algorithm with its own particular strengths, yet no real weaknesses. A storming debut for Carnes' new marque, then.